Do you have your wedding coming up? Well, that’s amazing – but planning a wedding is always a detailed affair and on top of that, you have so many people to inform about the celebration. There will be friends asking for your love story, there would be out-of-town relatives calling on for directions to the venue and so on. A wedding website here would be a lifesaver for you here, putting all the information you need to tell your guests and they need to know in one place. 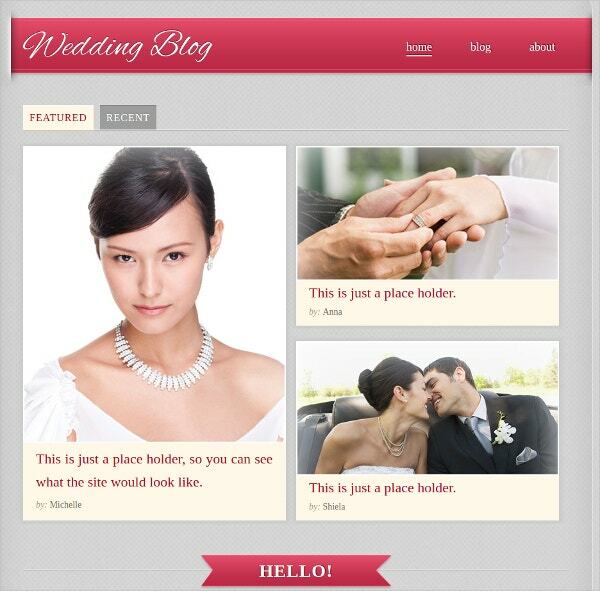 You May also See Wedding PHP Templates. Your wedding website would include a bio about you two so that relatives from both sides can know about the bride and groom well. Then, the website will also include briefs on how you two met, how your man proposed, how you courted and your thoughts or excitement about marriage. 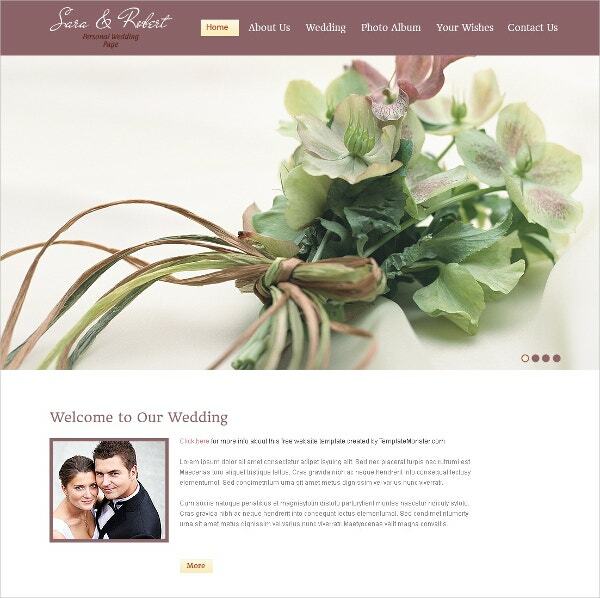 Creating wedding websites have got easier today courtesy the free Wedding Website Templates. 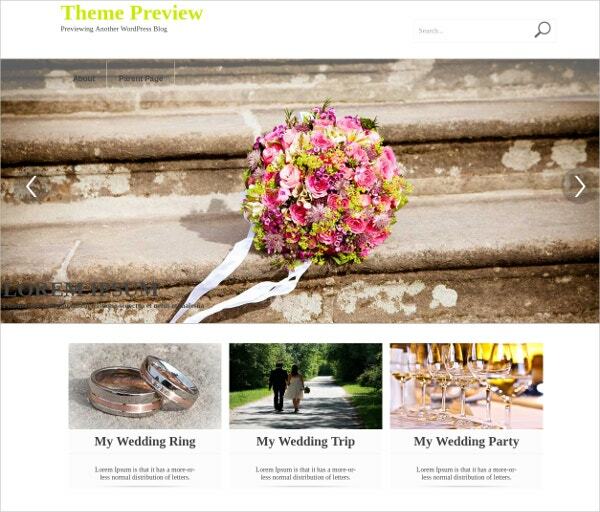 Weddings is a beautiful WordPress theme designed especially for enthusiast people interested in showcasing their wedding and making all their invitations online. 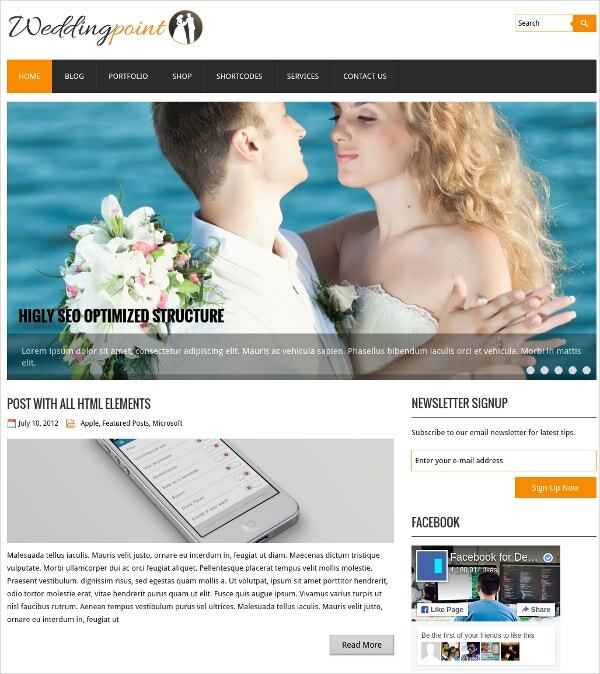 The responsive layout carried by this beautiful theme is packed with a wide range of features including: You May also See Wedding PSD Templates. This theme wonderfully helps to make your wedding classy. TwoGether is a beautiful theme designed to showcase your wedding and life events invitations such that your wedding may last in the memories of all. 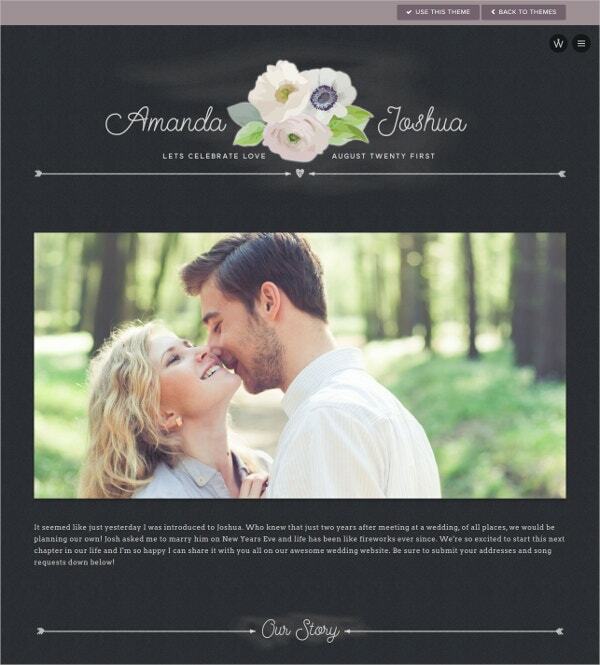 This theme features wonderful and clean layout with the photograph of couple as a header. 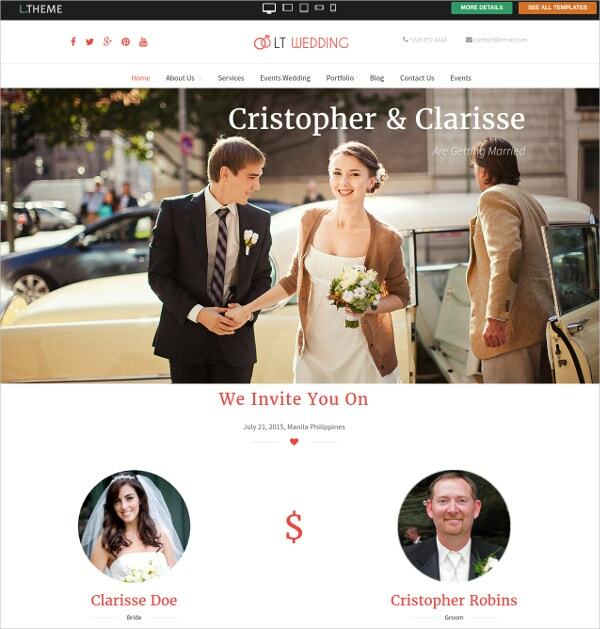 The various features carried by this theme are: You May also See Wedding Bootstrap Templates. Totally responsive to mobiles, tablets etc. 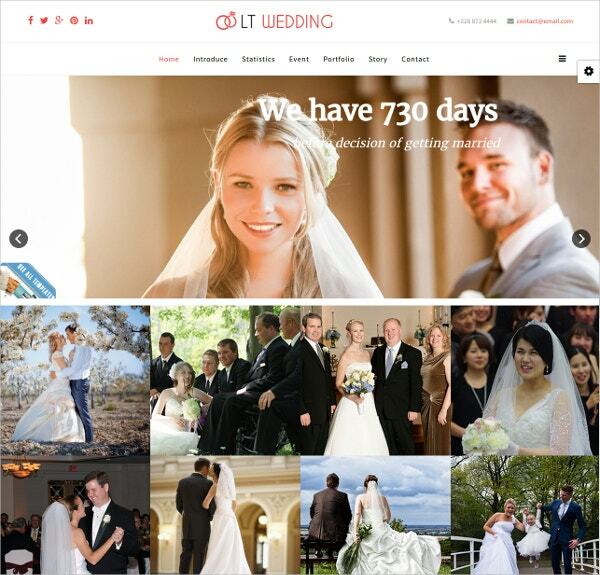 LT Wedding is a responsive website that is made to suit the mobile phone screens also. With the beautiful designs on it, the theme is a perfect option for wedding planners. The theme has been created with the options of CSS and HTML together. 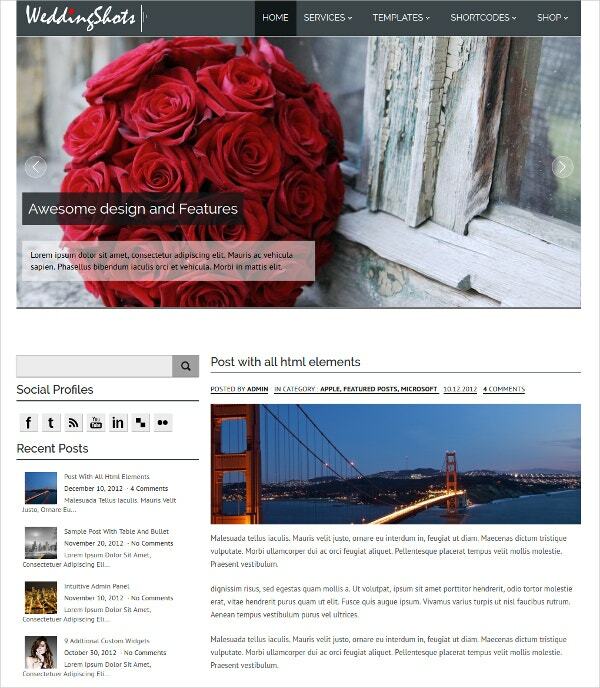 LoveBond Lite is a WordPress Theme best made for wedding planner. The theme allows you to design and customize beautifully various events of the wedding with details. The theme is fully responsive for mobile devices. It is compatible with childe theme. 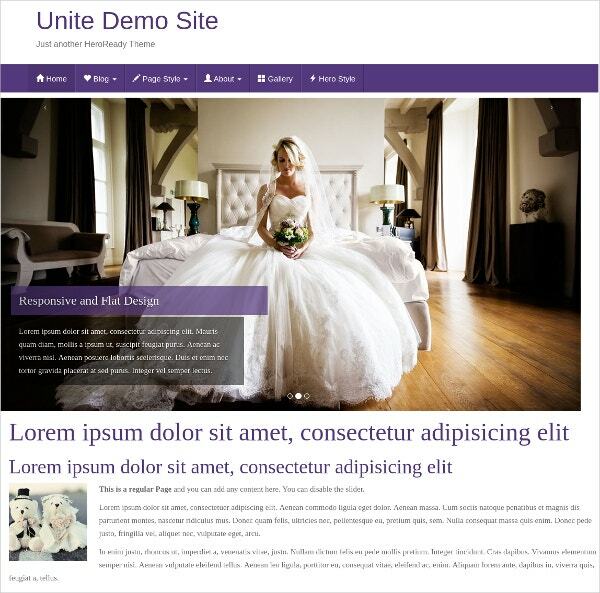 The theme is made with CSS3 and HTML 5 and is well documented that is compatible with major plugins. 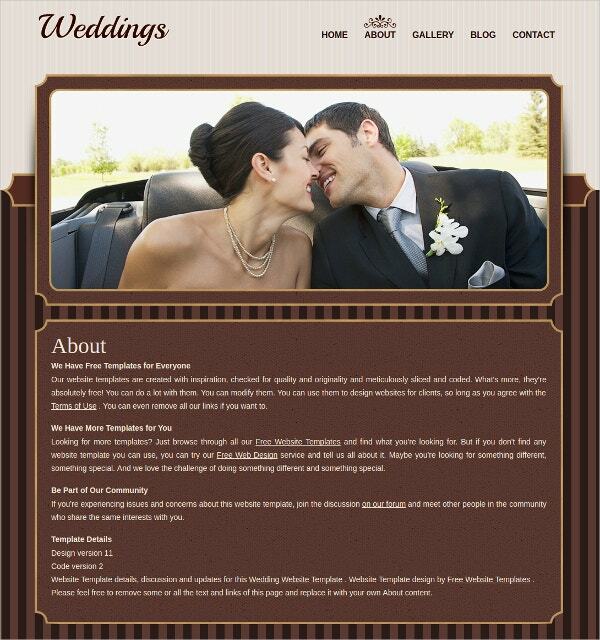 Wedding Day is a theme and template that is made for multiple purposes. Whether you wish to have a wedding planner or wish to create an album for wedding, this template is very much useful in such purposes. 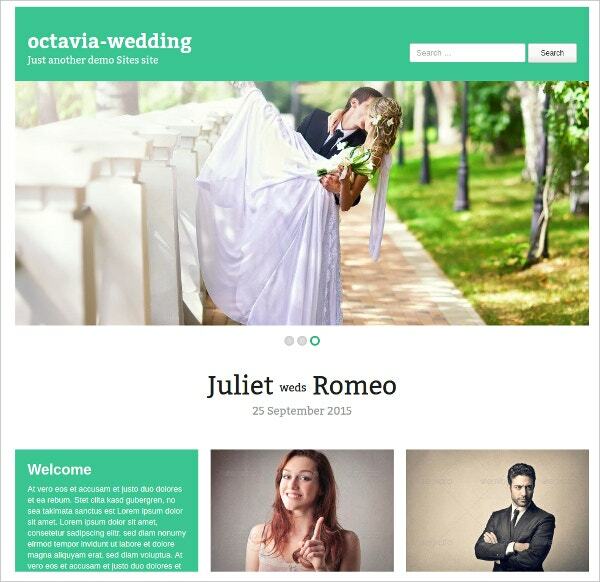 Octavia Merger is a wedding theme by Fab Themes. It is helpful in creating wedding albums for many in the most beautiful way. With various features, the theme is a complete package in itself. The theme allows configuring various banner ads easily at the side bar. 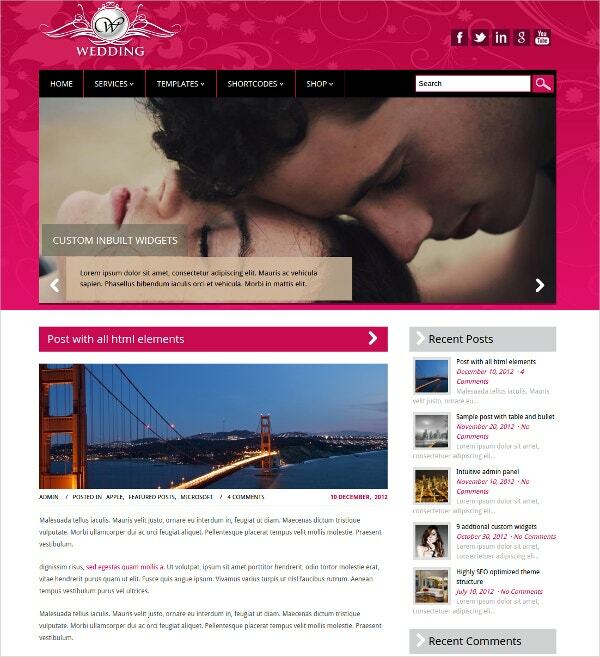 EWedding is a perfect for creating wedding websites. The theme is known to offer standard features and also some of the most modern features to be offered. 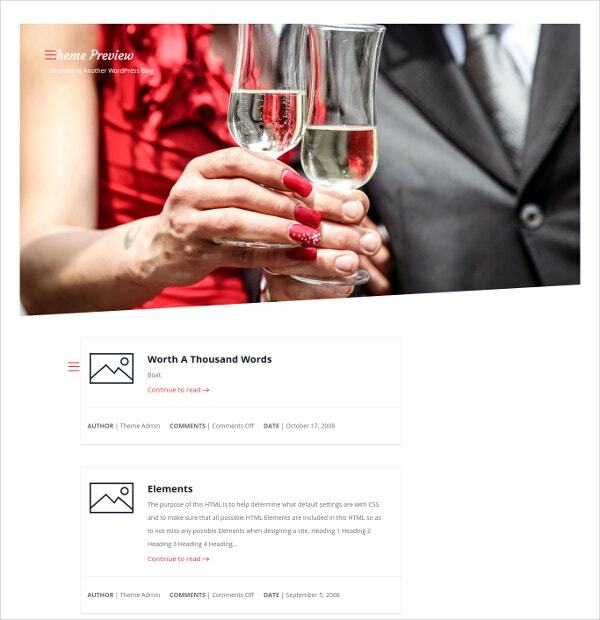 The theme will allow you to share your relationship details such as events like your first meeting on the timeline. The theme features sliders for homepage and is about to introduce WooCommerce soon. 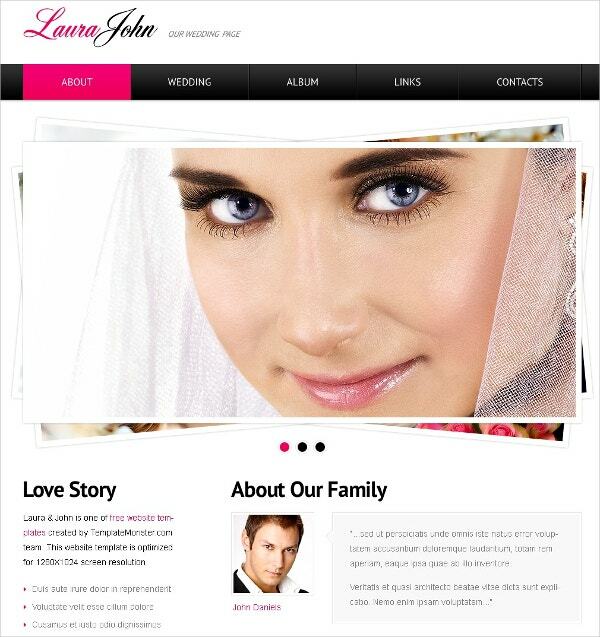 This template is ideal for website owners who have started or wish to start a bridal shop. A perfect template with well designed subpages is presented with a number of many other features. Designs are available as PSD files. The template is compatible with almost all the web browsers available at present. Stock photos for help, along with photos from your device. 24×7 customer care support provided. The template offers guaranteed satisfaction of a happy service as per your need. 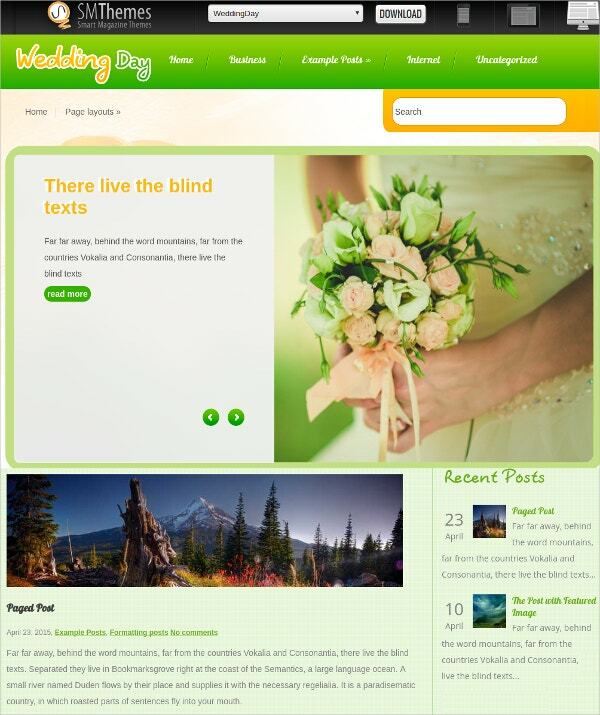 Fab themes bring Helix matrimony, a WordPress theme for the concept of matrimony service site. The theme has a number of features to offer. Apart from these features, the template also has various backgrounds, social bookmarks and social banner settings. 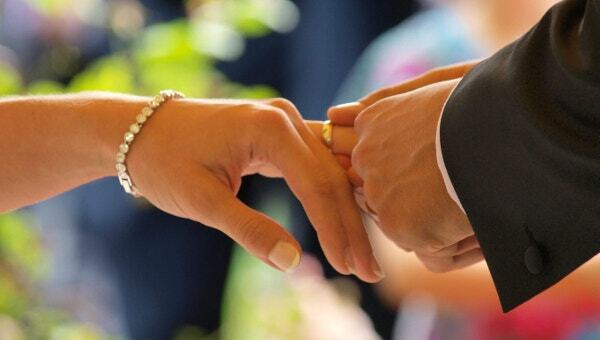 Wedding, birthday and other personal events are some special days that are cherished later on in life. This particular WordPress theme allows you to make these events even more cherishable with its enumerable features. Also the theme supports some extra features such as WooCommerce and Google Maps. People save memories of wedding in different ways. Saving it in the form of Free Bootstrap theme is simply amazing. With a number of features, one can create the magic again and again each time. It has a homepage, contact page and many other customizable pages. The web pages are in HTML 5 and CSS 3. The background can be customized with a number of colored offered. The theme is compatible with the web browsers Chrome, Firefox, Opera, Safari and IE9+. 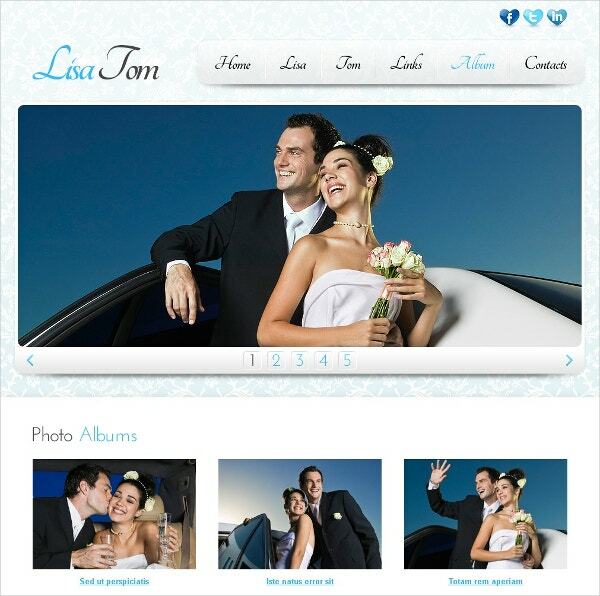 This WordPress theme is for couples who wish to create a memorable album of their wedding. The theme comes along loaded with shortcuts, sliders, thumbnails and contact form. The theme is compatible for both computer and mobile. 14 numbers of customized widgets are provided. The theme is compatible with the latest version of WordPress and also with all major web browsers. This theme is perfect for creating a wedding album so that people who could not attend the wedding can enjoy each and every moment of the event. The theme along with its varied features offers a great display. Names and other details can be arranged in header footer or other suitable places. 4 custom widgets are there available on the homepage. Banner ads can be configured at the side bar of the template. 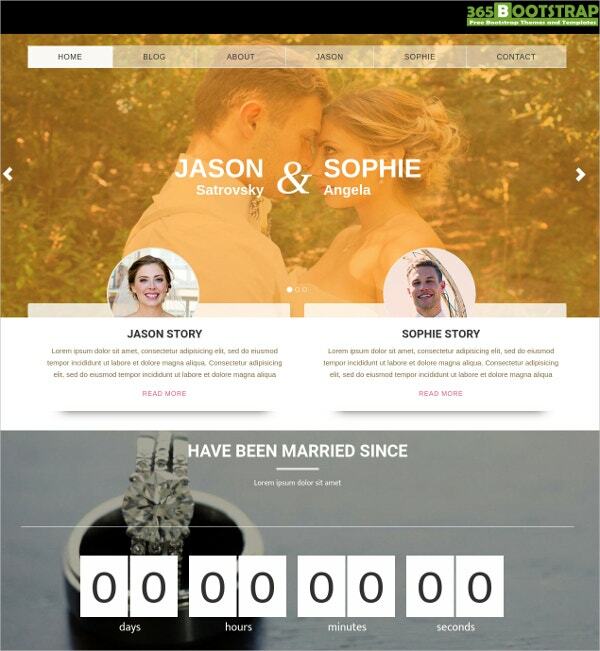 If you are planning to start a business for creating online albums of wedding events, then this template can be very helpful. With a customer support that is available for 24×7, the template provides great service with varied features. Stock photos are available for life – time use. This is a free template that can be used for events like wedding. HTML plus flash is for animation. To get a better result, you may have software like Adobe Photoshop with the template. Now this is an amazing template that has been designed for those who are planning for their wedding ahead. Also it can be great for those who wish to create album of past events of weddings. 14 different customizable widgets and themes are available. The template is available in multiple languages and is compatible with latest WordPress and browsers. Well, first and foremost, the website will help you to list all important information about the wedding on a single portal so that your guests can check them anytime. Be it information about your wedding date or wedding venue or engagement party or travel accommodation or direction to the venue- you can include everything there. 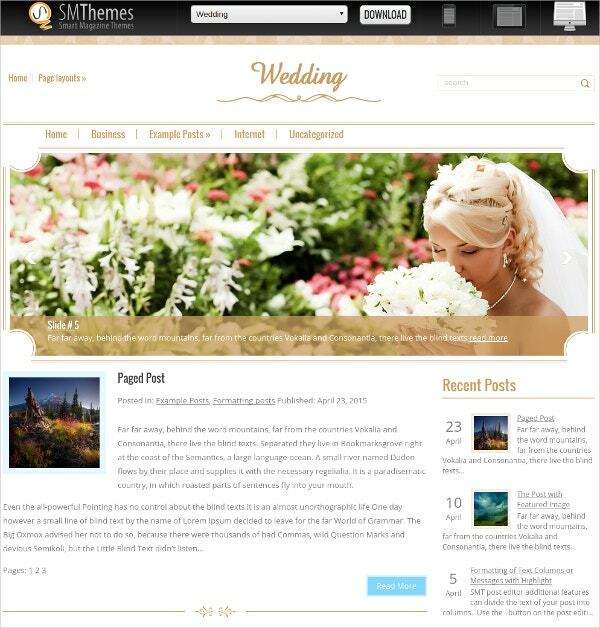 You May also See Wedding Blog Templates. Then, you can even save on printing out the invitation cards or at least save the date cards through the wedding website as the guests will be able to check the dates whenever they want to from the website. On their part, they won’t even need to waste money on calls to you to clarify the dates, venue or other data about the celebration. 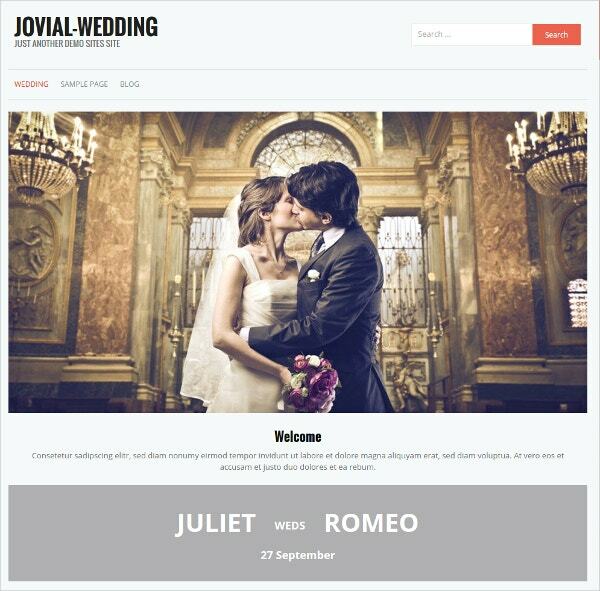 You May also See Wedding Joomla Templates. 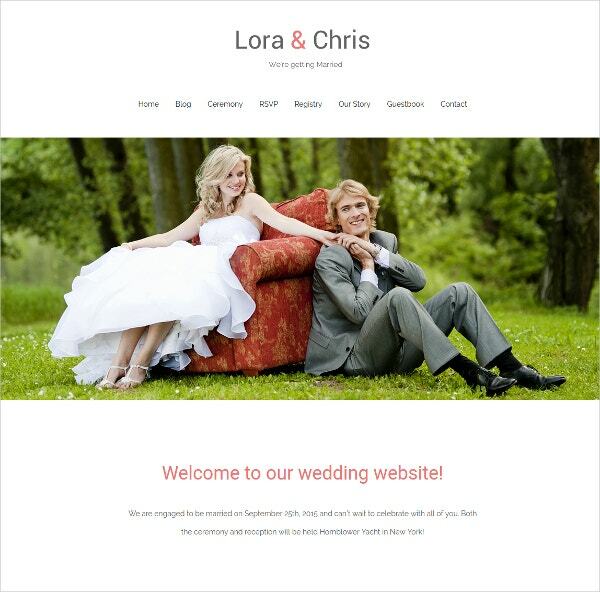 Another crucial benefit of having a wedding website is that the wedding website templates will assure easy RSVP for the guests. Finally, having a wedding website is always an eco-friendly approach as it encourages you to save paper. 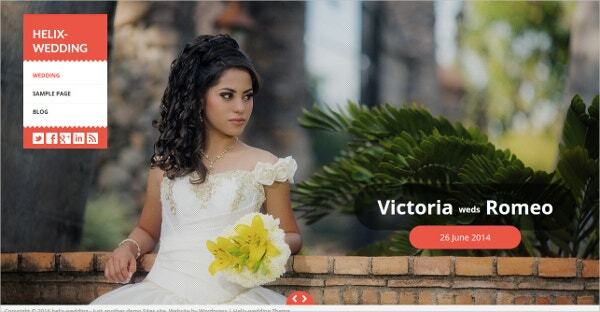 You May also See Wedding PrestaShop Templates. 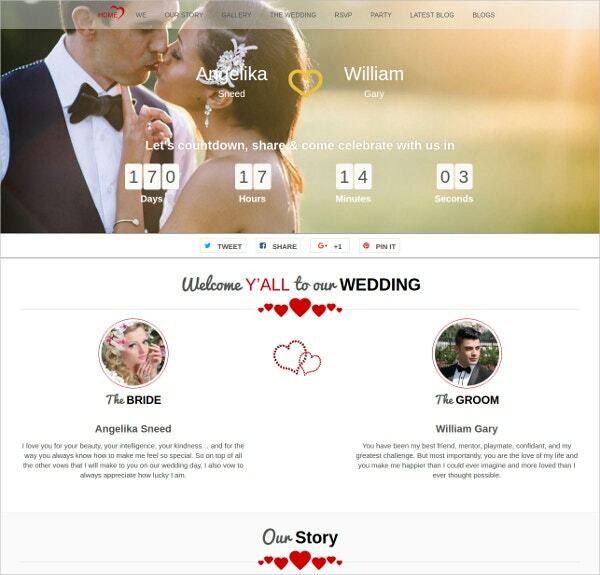 Creating a website from scratch in the midst of planning your wedding is always a huge affair and in such situations Wedding HTML Templates are always handy with their readymade website framework. Moreover, you can customize these templates anyday as per the typical feel of your websites. 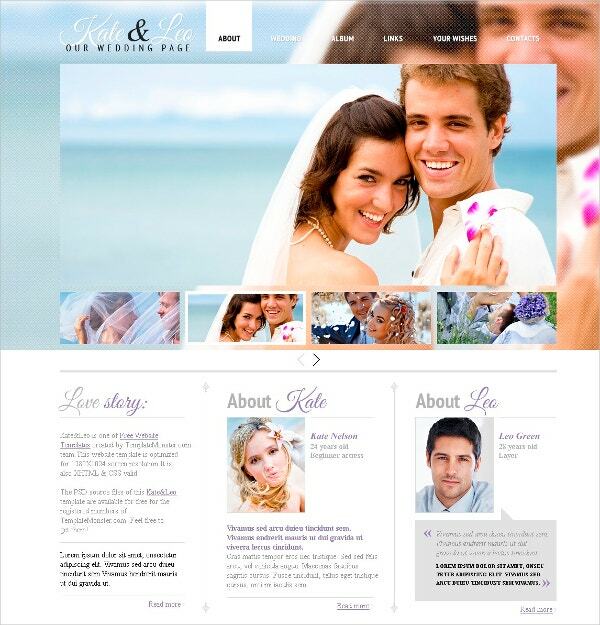 If you have limited content and you wish to keep the matter brief, there are one page wedding website templates to take to. Then, you will also find responsive wedding website templates so that the website can be viewed easily from all browsing devices. Finally, as many of them are available free of cost, just imagine how much savings you are going to make! 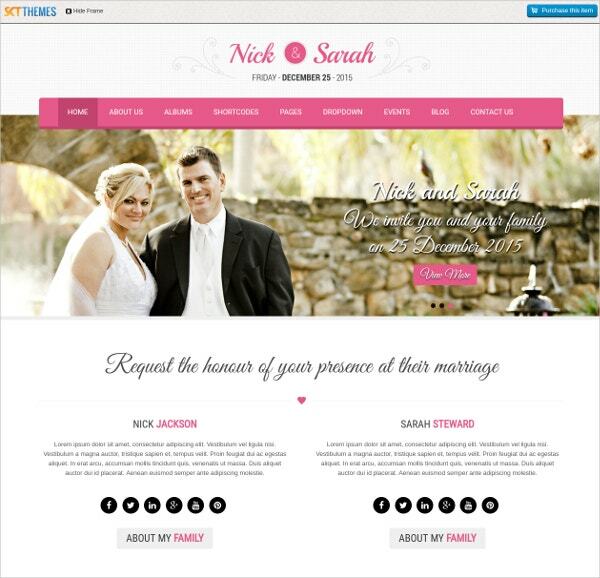 If you are looking for best free wedding website templates, you can easily have your ultimate pick from our huge collection at template.net.